A dozen people onboard a paddle-driven raft chorused with expressions of amazement as flashlights cut through the darkness of a magically-hewn cavern serving as an underground passage in this quaint rural town of a long river straddling from the lower slope of the majestic Mt. Mayon. Called the Quitinday Underground River situated in Barangay Quitinday, less than a kilometer from the downtown, this extraordinary water conduit offers a narrow arch at its upstream entrance to where the rapids turbulently flow into the four-meter-deep pool inside the cave. The cave’s width varies from five to eight meters, depending on the irregular span between its walls that feature a strange buildup of finely sculptured limestone rocks that eerily look like an army of animated small minions in fancy formations. Water feed by founts at its ridge also drops intermittently from the cave’s roof, a continuing natural episode that forms overhead stalactites and stalagmites. Hundreds of visitors coming daily, especially during weekends, won’t miss exploring with awe the 150-meter-long underground river via bamboo rafts manned by young “boatmen” who skillfully propel in darkness their makeshift watercraft through its clear, cold and serene waters. Quitinday River’s fantastic features also include a series of waterfalls, the most prominent of which is called Sigpit (constricted) Falls because of its ensconced between exciting rock walls wrapped in vine roots and foliage, giving it high and narrow attributes. Across the about one-kilometer descending span of the river along the visitors’ park established lately in the area, the throngs of visitors coming on a daily basis and more on weekends would wade and swim on the turquoise, cool water for hours to beat the summer heat. “It has been a habit for me and my friends and workmates to be here during off-work days to escape the irritating heat of summer,” Daisy Roaring of the neighboring town of Guinobatan told the Philippines News Agency. According to Ludy Boreta, the town government’s tourism officer, the place receives weekly this summer around 3,000 tourists, visitors, picnickers and excursionists who are thrilled by the experience of exploring the underground river and fascinated by natural environment that offers a cool and relaxing atmosphere. Another facet that makes Quitinday River an astounding natural asset is the chain of 10 major cave systems that have complex patterns of superimposed passages representing a long history of cave development. Experts who recently studied the antiquity of the place theorized that the flow velocity of the water that extracts clastic sediments from the river gullies made of massive limestone rocks may have formed over centuries the cave systems. All these wonders of Quitinday are arranged along the foot of Makatanaw-Dagat, a lushly vegetated peak towering about 500 meters over the municipality to offer unobstructed views of Mt. Mayon, Ticao and Burias Passes off Donsol and Pioduran towns and Albay Gulf by Legazpi City. A series of founts that marvelously jet in forms of tiny waterfalls into the river is another special attribute of this peak. 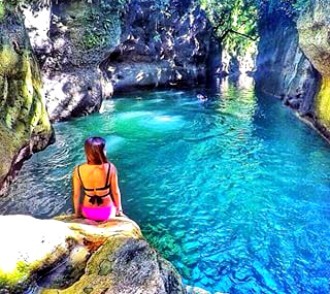 Incidentally, this town is not just about Quitinday when it comes to natural wonders as still, three kilometers from the poblacion is Magtaguinting Falls of Barangay Bagacay, a broad waterfall that grandiosely offers an alluring natural beauty. Its water turbulently cascades from the height of 120 feet into the Naglaus River which is part of a natural formation of largely unexplored underground waterway whose 500-meter long tunneled river, which looks mysterious and weird, can also be navigated using bamboo crafts for a unique experience. This underground river is a grotto-like cavern system set at the hillside of Barangay Del Rosario, about seven kilometers from the town proper traversable to the next barangay of Nabasan, Daraga, Albay and known as the local version of the Puerto Princesa Underground River in Palawan. The river cave is naturally inspired by nature as at its mouth locates a clear and cold lagoon framed by a unique formation of limestone rocks. Another one of these nature’s gifts to this small, sleepy municipality listed as one of the poorest in Albay is the Quibaraw Falls in Barangay San Vicente, three kilometers from the town center. This waterfall, which cascades from 120 feet at the slope of a mountain karst with a full massif landscape protecting a forest that surrounds a deep lagoon bordered by fancily arranged rocks, can be reached via a one-kilometer ascending foot trail that traverses thick patches of old growth trees. Apart from all these marvelous natural formations, the municipality is also called the “river town”, being traversed by seven major rivers, among them the Jovellar-Donsol River, which strategically runs through the center of the municipality from its source in Camalig town; and Cagnanaga River along its eastern boundary that empties into the Ilog River.